For those of you who live under a rock, Music Biz Day is the largest free and open to the public music industry conference in the state of Texas with over 700 registered attendees in 2018. The one-day conference is a gold mine for making connections, getting to know the Texas music scene, and learning from a variety of industry professionals. Oh, and if that wasn’t enough, Music Biz Day also serves free breakfast to all of its attendees. Let me say that again, FREE BREAKFAST! Music Biz Day was founded in 2016 by Dr. Stan Renard, Head of the Music Marketing Program at UTSA. He wanted to give his students a taste of the industry, and what a better way to do it than to bring the industry to them. The conference consists of several panel discussions where veterans in the music business share their knowledge and talk about the latests trends in the industry. In the past, topics have included music technology, music festivals and concert production , licensing and publishing, songwriting, and more. 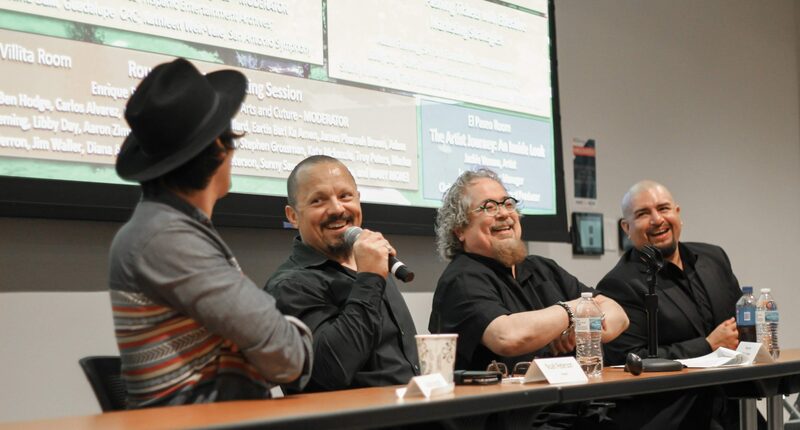 Here are a few of the businesses and organizations that have shared their knowledge at the event: The Texas Music Office, Scoremore Shows, Grammy U, Mood Media, BesMusic.Net, The Aztec Theatre, BeatStars Inc, Azteca Music Group, and more. A highlight of the the 2018 conference was the ‘Round Table Discussion’, where selected professionals were paired with attendees. Similar to ‘speed dating’, attendees got 10 minutes to ask questions to the assigned professional before they switched to a different group. Suhail Arastu (Director of Development and Marketing at Musical Bridges Around the World) sharing his knowledge at the ‘Round Table Discussions’. Music Biz Day also allocates some networking time to its attendees in the vendor hall, where you can find a variety of local music businesses, music schools, and music services. It is highly recommended for attending students to bring resumes during the networking session. Be prepared, you might be walking out of the conference with a new job or internship! Left: Kerry Valderama (Alamo City Studios) engaging in a conversation with student attendees. Music Biz Day 2019 will be held at the UTSA Downtown Campus on April 6th 2019. RSVP is required to attend, so don’t wait any longer. Register Now!